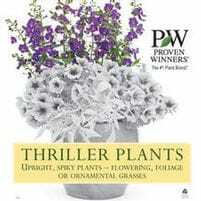 Thriller Plants are used either in the back or middle of a container. They are usually a taller plant that adds height and drama to the your container. For pot sizes from 12" through 18" in diameter add one thriller plant to any upright container planting. Pot sizes larger than 18" many require additional plants to fill out the container. If multiples thrillers are needed, our suggestion is to use the same plant not different plants. Great Container Plant, Drought and Heat Tolerant, Flowers All Summer!